Come and experience paradise in Marco Island, Florida. All you need is your swimsuit! Enjoy our NEWLY UPDATED AND FULLY FURNISHED CONDO featuring new paint, new TV in master, new decor, and new 48' HD TV, BLU RAY PLAYER AND FREE WI FI IN THE UNIT. Enjoy this South Seas Tower 3 condo (9th floor) where you will wake up each morning to hear the ocean waves outside your bedroom window. Watch the day come alive as you have your morning coffee on the balcony overlooking the expansive Marco Island beach and the breathtaking Gulf of Mexico. This unit features 2 bedrooms and 2 full private baths. All have been updated with new towels, bedding and 350 count sheets for your comfort. The master has it's own balcony and looks over the beach. There is a large living room with a balcony also looking over the beach. The two balconies are joined. The kitchen has a stove, dishwasher, microwave, coffee maker and blender. There is large dining table with 6 chairs between the kitchen and living room. While on Marco, you can spend hours shelling on Tigertail beach, swimming in the pool or ocean, which is just steps from the building, relaxing on the beach, exploring numerous restaurants, shopping, golfing or playing a match of tennis at the South Seas Tennis Club across from the condo bldg. In the evening, your view toward the southwest will offer the sparkling lights of the Marco skyline. THIS IS IMPORTANT WHEN LOOKING AT MARCO CONDOS. Views toward Tigertail (or North views) will turn completely black after sunset. There is little or no 'dusk' on Marco. The nighttime beach lights add to this condo's appeal. And Marco's island charm will captivate you and provide you a vacation you won't soon forget. UPDATE MAY 2012 - new bright wall colors and decor, new outdoor cushions, new kitchen island/cart, new faucets in both bathrooms and kitchen sink, 4 new beach chairs, 3 boogie boards, 3 noodles & new screens on both sliders. Please contact us for additional pictures and if you'd like further information. Thank you! We are a family of 5 with 3 children. Our kids grew up traveling to Marco to visit their grandparents. We have years of wonderful memories of sunsets on the beach. We have been traveling to Marco Island for over 20 years and have created many memories there. This condo is unique with it's gulf views and expansive beach front. And, you can sit in the pool and still see the beach and ocean! It was noisy at my unit since they were working on 2 other units on my floor (Windows). It was understandable and manageable. More of a problem was they were also working on the bathrooms on the lobby floor the whole time I was here. It was inconvenient when I was at the pool. We thoroughly enjoyed our stay in Marco Island. The condo was lovely, extremely clean, and had all necessities. The beach is right in front of the condo and is great for shelling. We saw dolphins daily swimming in front of the condo. We also saw live starfish, sand dollars, and counch shells. There are numerous things to do, Tin City in Naples has lovely shops and great monkey bread. Doreen's is a must for breakfast or lunch and is across the street from the condo. 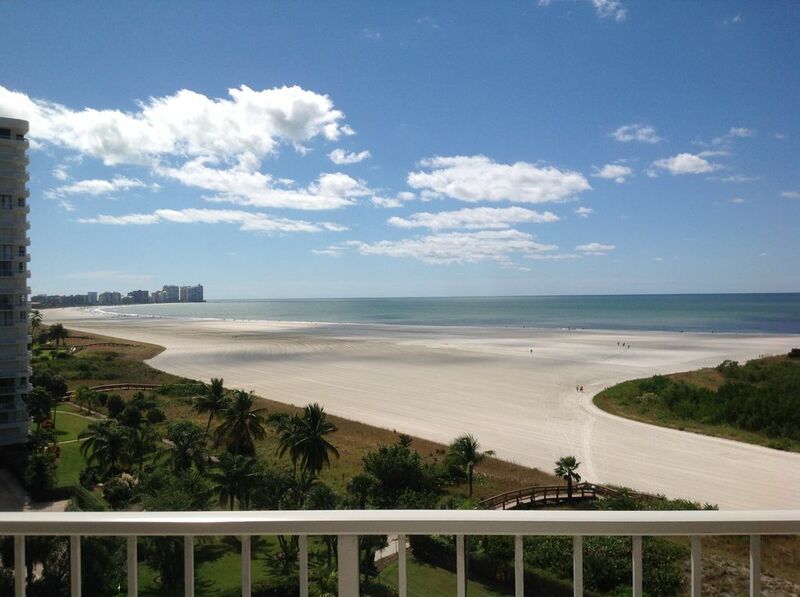 Marco Island is a must and this condo could not have been in a better location. Great condo, great location, gorgeous views! The condo was spacious and had everything you needed to have a great time. The closet full of beach supplies was very helpful. Paula was easy to book with and even went out of her way to get my daughter's glasses back to us that she left behind. Condo is close to shops, restaurants, and grocery stores. Plenty of room for our family of 5. Unit has almost everything you'd need. Beautiful view of a the ocean from the unit. One of the widest beaches I've ever been on. The sand is hard and packed so easy to walk across to the water (it takes a few minutes). Make sure you take a walk north on the sand! We saw lots of fish, conch, welk, more sand dollars than imaginable, a string ray, a sea horse, dolphins, and many types of birds. Catch a sunset from the water's edge. We are all about family time so this was a perfect quiet vacation get away. Very nice unit in a wonderful setting. We had a great time on the beach and at the pool. South Seas is a well maintained property - a nice pool, shuffle board courts, pickle ball and tennis courts, and, of course, is right on the beach. I will respond to your inquiry and will secure the dates if available. A written rental agreement will be created and emailed. Taxes are included. Rates are subject to change until reservation is confirmed.